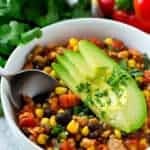 A thick and bold chili full of ground turkey, vegetables, beans, and spices. Heat the olive oil in a large skillet over medium-high heat. Add the ground turkey, chili powder, garlic powder, cumin, smoked paprika, salt, and pepper. Cook for 5-7 minutes until turkey is browned. Break up the turkey into smaller pieces with your spoon as you stir. Place the turkey in a slow cooker along with the onion, bell pepper, chicken broth, tomato sauce, and diced tomatoes. Stir in the black beans and corn, cook, uncovered for an additional 20 minutes.